Orthodontics was the very first specialty branch of dentistry. While general and cosmetic dentistry focus on tooth health, smile aesthetics and the health of the soft tissues within the mouth, orthodontics focuses on the bite, the alignment of the teeth and the overall functionality and appearance of the smile. It is a form of dental care that normally takes place after the adult teeth arrive and structural problems with them have been identified. In some instances when patients have congenital defects that impact the functionality and structure of the teeth, orthodontic treatment may be recommended even before the adult teeth have grown through. What Orthodontic Treatments Are There? These days there are an array of dental devices that can assist with orthodontic care to correct large gaps between the teeth, crooked teeth and an improper bite. Facial injuries due to impact, thumb-sucking, tooth loss or diminished bone structure and congenital defects are some of the many reasons why people might seek orthodontic care. Orthodontic treatments can include space maintainers, clear braces, headgear, plastic aligners and retainers among other dental devices to achieve a nicer smile. At Frenchs Forest Dental, we also make special orthodontic plates for children with baby teeth. These are made on children that have experienced trauma or occlusions. In many instances, orthodontics can be just as important for creating a functional and attractive smile as general dental care. Straight teeth not only look better than teeth that are crooked, spaced too close together or too far apart, but they are also much easier to clean and maintain. Thus, orthodontic treatment can minimise the likelihood of tooth decay, gum infections and bone loss. 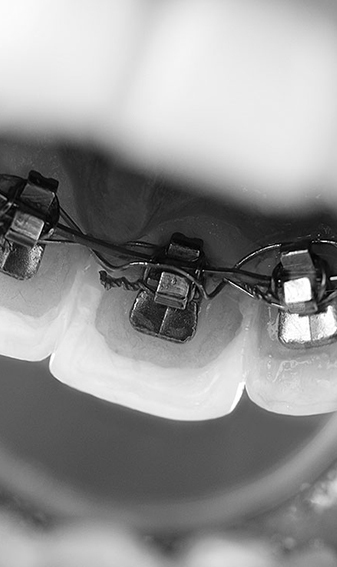 Orthodontics can assist in the preservation of the natural tooth structures by preventing the excessive wear. It is also important to note that those who suffer from structural issues that impact the overall functionality of the teeth can develop chronic jaw, neck and head pain. Some children have behavioural problems which are caused by narrow maxillary (upper jaws), this is usually shown by snoring, tooth grinding and crusty noses. The narrowness of the upper jaw does not allow normal breathing through the nose and prevents the secretion of Serotonin and Melatonin during rapid eye movement (R.E.M) sleep. These hormones control behaviour and if the child does not achieve R.E.M. sleep, the hormones are not produced. This is often demonstrated by a badly behaved child who is disruptive at school and is regarded as A.D.D. A Maxillary Expansion Plate opens up the sinuses and allows more air flow through the airways, stopping the snoring and allowing R.E.M. sleep to occur. In most cases, the use of Maxillary Expansion devices can improve the child’s behaviour without the use of heavy duty drugs. We use clear plastic aligners to straighten adult teeth. We realise discretion is very important. No one but you will know you are wearing these appliances as they slowly move crooked teeth. The sequential aligners move the teeth by a small amount every two weeks, so that there is very little chance of nerve damage which can happen with braces. For more information about orthodontics, contact us today on (02) 9452 5600.